G&A is a leading provider of specialist roofing services including emergency roof repairs, gutter repairs and chimney repairs. Our trained roofers deliver top-quality care for homes and businesses with a guarantee of first-rate workmanship and affordable prices. We help you keep your property in top condition with a vast range of services suitable for commercial and domestic properties of all shapes and sizes. For emergency care and quality repairs, contact a roofer from G&A Roofing and for help today. We’ll be happy to discuss your requirements and offer free advice over the phone. Call our team of experienced roofers on 0800 626430. Our roofers deal with all aspects of roofing work. We can help you with leaks, guttering, chimneys, boilers, radiaters and many more problems. Speak to our team to find out more about the services we offer. We provide gutter cleaning, replacement guttering, repairs, replacement downpipes, fascias and soffits. At G&A, we deliver a full maintenance service to ensure that water can flow freely from your property. Standing water and gutter blockages can lead to major issues with your roof and the roofers at G&A understand the importance of a maintenance program to keep guttering working as it should. Call us for a professional solution today. In an emergency, call a roofer for an immediate response. For leaks and water damage, storm damage and urgent care, we act quickly to prevent the problem from spreading. A professional emergency roofer will attend your property fast for urgent roof repairs when you need it most. Speak to our friendly team for help today. We can provide you with a professional report or survey. A roof report will assess your roof and help you take action to prevent damage and help you maintain your roof through the years. When buying a property, a roof survey will help ensure that you’re paying the right price for the property and could save you serious money. Speak to a roofer to find out more today. Our roofers specialize in chimney repair work. As the highest point of your property, chimneys suffer exposure to the worst of the weather. We deliver chimney repairs for all types of properties, even listed buildings and large commercial properties. 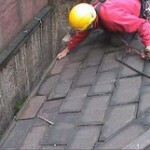 We deal with worn lead flashings, damaged brickwork, leaks and other issues. Contact our friendly team of roofers for advice. This is just a small sample of how we can help you maintain your property. Please contact G&A Roofing and Building to find out more about our services. G&A Roofing and Building is a well-established roofing firm that is known for providing top-quality workmanship. Each roofer is trained and for your safety, we will undertake a full risk assessment before starting work on your property. We work alongside our customers to ensure we provide the right solution at a price that’s right for you. We are happy to offer written estimates in non-emergencies and we like to work in a transparent way so that you know where you stand every step of the way. We are members of the Confederation of Roofing Contractors, a leading trade body. As leaders in our field, we pride ourselves on maintaining the very highest standards of work. We’ll give you an honest assessment of your property and we’ll even clean up when we leave.